Up until a few months ago, I was mostly a make mine Marvel kind of girl. Hanging out with new friends who have known and loved the DC Universe for a long time has made me want to get into those comics, but gosh, where do I start? Cue announcements for the DC reboot. And now, here we are with the flagship title, Justice League #1. I'm already hearing the disappointment from the old fans who dislike it, and the old fans who refuse to even touch it. I'm not completely ignorant of the happenings in the DC universe or within the Justice League itself, but there's enough I don't know to make this reboot work for me, potentially. I'll try to set aside my biases over the limited DiversityTM (no offense, Cyborg, but who else were they going to pick?) and simply try to take this opportunity to get into a series of comics that have previously eluded me. In previous books, Batman has threatened to beat Jordan within an inch of his lantern if his glowing green aura gave away his position, and in this book Jordan's all "HAI GUYZ! I LIKE GREEN!" I'm not exactly sure how the decision is made to go from Gotham to Metropolis to check out this Superman whom Batman has researched and determined to be a significant threat and how he might relate to the alien that just shouted something about Darkseid, but voila, we are there! with a brief pause to meet the soon-to-be Cyborg in the highs of his football career and lows of his family relationship. A cocky Green Lantern is determined to take on Superman alone, but a plucky young Superman has other ideas. And then ... oh ... that's it. Really? That's it? Authorities don't like superbeings (at least not in Gotham) and like to blow them up. Green Lanterns are everywhere, but hopefully, not all of them are as clueless and arrogant as this one. I was hoping for a Happy Meal, but I barely got an appetizer. Turning the page, we get the sketches and descriptions with a focus on the new look of the team members. 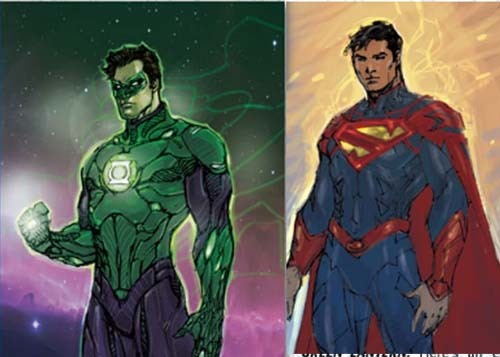 This is where my disappointment really came in because they revealed older sketches of costumes, placing emphasis on the fact that Green Lantern and Aquaman's costumes in particular were just too "complicated" to pull off. Sorry, Aquaman, it's waaaay too much effort to make you or your friends look cool, so back in your tacky goldfish scales you go! We know about the issues with Wonderwoman's pants, but prior to the release, she was back in her underwear while the boys all lost theirs. Meanwhile, everyone gets an "armour" upgrade, as in, with a few lines here, and a bit of extra shading and shine there, voila! Everyone is wearing "armour!" Annnnnd.... when I read Darkseid is coming... I immediately heard that in Jon Snow's voice. LOL.